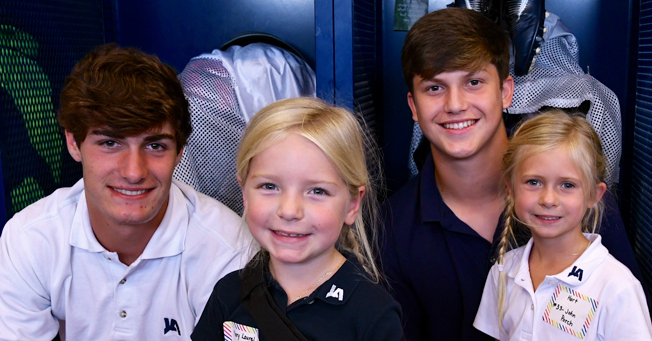 That’s what it’s like to be on campus at Jackson Academy. Every day, our students get involved in tons of eye-opening, heart-pounding activities. Love to lead? Serve on Student Council. Powered by faith? Join Fellowship of Christian Athletes. Curious about sports broadcasting? Try the Raider Network Club. Want to kayak down the Gauley River? Outdoor Club is for you. Don’t see a club you’re interested in? Start your own! Raiders also give their all in the thousands of hours they commit to community service every year. They tutor kids at a local elementary school, build houses with Habitat for Humanity, and take food donations to homeless shelters. And the best part: Our students do it all together. Because that makes every new adventure, well, a lot more fun.